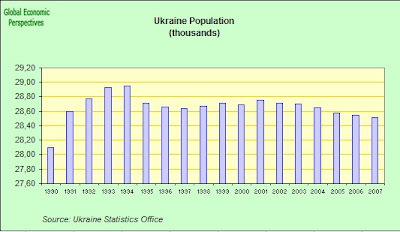 Whoever wins the elections which are being held in Ukraine today, one thing is certain: they will have their work cut out, since Ukraine is a country with a very large accumulated set of problems, and of course, its size (in a European context) means that it is also a country which few (and especially those countries in the European Union) can afford to ignore. The project of modernizing probable first lady Hayrunisa Gül's headscarf is becoming a reality, reported the Hürriyet daily. Atıl Kutoğlu, a renowned Turkish designer living in Vienna, is planning to cooperate with Hayrünisa Gül on her new headscarf style. “I have different ideas about the new style of Mrs. Gül's headscarf in my mind. But we have not yet come together and therefore it would not be appropriate to make a conclusive statement. In the following days, we will meet with Mrs. Gül to work together on the project,” Kutoğlu said. Turkey has, not surprisingly, been receiving a good deal of attention in the news media of late, some of it, as can be seen from the above quote from the Turkish Daily News, verging on the frivolous. 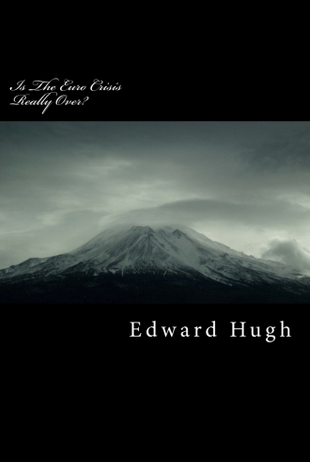 We could ask ourselves, however, whether this topic really is such a trivial one as it might seem at first sight? As Manuel notes in his accompanying post, former AKP Foreign Minister Abdullah Gul was sworn in as President last week. And despite the initial knee-jerk reaction from those who equally had their own ideas about the new president's wife's style of headscarf, economic rationality and fundamentals have since reasserted themselves with the consequence, for example, Turkey's lira has now advanced for three consecutive weeks against the dollar. This is a performance which, in the current volatile environment, is much better than we are seeing from some other emerging market currencies. So someone somewhere now is more convinced by Atıl Kutoğlu's conceptual vision. But, joking aside, it is perhaps a not a completely useless and worthless exercise to ask ourselves whether the significant losses incurred by Turkey's benchmark 2030 bond the day after Abdullah Gul was officially sworn in as President may not offer a striking reflection of how the financial markets - in this case at least - were rather more behind the curve (or better the curves, the ones in Hayrunisa Gül's hairline) than they were out in front of it. Indeed we may well wish to ask ourselves about the extent to which such behaviour was in any way rational? After all, and at the end of the day, the wearing of a headscarf is nothing more than a rather modest expression of religious sentiment, and as Morgan Stanley Turkey specialist Serhan Sevik never loses an opportunity to point out to us the party which really represents Islamic politics in Turkey was roundly defeated in the recent elections coming in with a mere 2% of the votes. So going by the past record, and after an acute bout of institutional conservatism during the last months of the Sezer presidency (a conservatism which more often that not was what actually lay behind the negative comments which Turkey was receiving in the international press), may we perhaps not expect and look forward to a Gul era where continuing structural and institutional reform accompanied by a growing modernisation of economic and political life become the norm? I think we may, especially when we take into account that the after the electoral trouncing the CHP recently received, the Turkish military may be in no mood, even for sabre rattling. Fortunately there are voices of reason hard at work out there trying, as best they can, to explain the obvious. Danske Bank's senior analyst Lars Christensen, for example. Chrisensen tells us that "while Turkey's secular elite sees the AKP as a threat to Turkey's secular constitution, most foreign investors see the AKP as a reformist force that will bring Turkey closer to Europe and open the economy,"
Indeed, as I intimate during my discussion of Turkey's need for pension reform (see the next part of this post), Turkey's old institutional elite may now with good reason fear that something more than the old secular constitution is in the process of being threatened. So, as we move into a period of potential instability and growing sensitivity to risk in the emerging credit markets, this does seem like a timely moment to ask ourselves about the underlying solidity of those ever so famous economic "fundamentals" in relation to Turkey. Just how sound is the Turkish economy right now, and just how warranted are those nervous twitchings in the vicinity of the lira which we have been seeing, off and on, since the middle of August? Manuel has already to some extent tackled the question of Turkeys stability from the political angle (I also had a crack at doing so in this post on a Fistful of Euros here). So here I will concentrate on the economic aspects of the situation (although I would just to take time out to mention at this point the interesting parallels which are to be found between what has happened in Turkey, and what may now be starting to happen in Morocco). In the midst of all the political debate and tension which has surrounded Turkey in recent months, one fact stands out above all the rest: the extent and duration of the economic revival which Turkey has been experiencing in recent years. 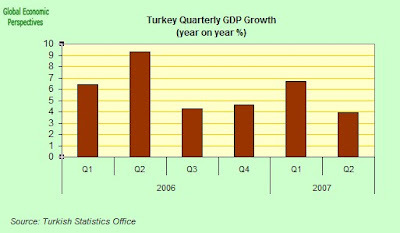 The application of well-founded economic policies, which are anchored in an ongoing EU accession process and backed-up by a steady flow of International Monetary Fund reviews and arrangements, has given Turkey an increasing degree of political and economic stability which, when these are added to the extremely favorable external conditions which have until recently prevailed in the global environment, have produced impressive average annual GDP growth rates which have hovered in and around the 7.5 percent mark since 2002 now, as can be seen from the chart below. Investment and private consumption have been the principal drivers of this growth, and for a number of years is was steadily fueled by a poweful cocktail of declining real interest rates, surging capital inflows, rapid credit expansion, and rising productivity. In addition, if we strip out the crisis-related spike of the last 12 months or so, inflation has been dropping steadily and dramatically over the past five years, as can be seen below. All of this is quite striking, all the more so since, prior to 2001, Turkey had one of the most distorted economies in the OECD ambit, with volatility in real GDP growth increasing from 2.5 in the 1980s to 5.2 in the 1990s, rising to a crescendo of 8.4 during the 2001 crisis. Prior to 2001 Turkey had, in fact, been characterized by a series of boom-bust cycles which were normally accompanied by extended periods of financial fragility. However, political consolidation post 2002 and a much more favourable demographic environment have led to both growing economic rationalization and to a considerable reduction of business-cycle volatility. The volatility of real GDP growth (or any other macro variable, for that matter) have declined to historically low levels post 2001, while total factor productivity growth has surged to around 5% a year. The combination of economic normalization and a favourable demographic headwind have functioned as a kind of technological innovation shock on the Turkish economy — accelerating both productivity growth and the level of sustainable output growth. I will examine a number of features of Turkey's favourable demographic situation in more detail below, but for now lets take a look at one key indicator, median age. 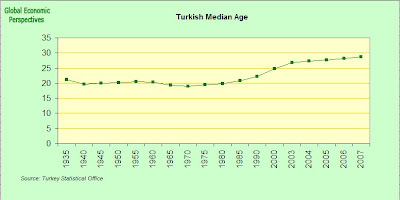 As can be seen from the chart, after several decades of hovering in the 20 to 25 age bracket, Turkey in the late 90s punched through to the 25 to 30 range, and as we can see from the most recent data, Turkey's median age is now on a forced march upwards towards the 30 to 35 range, and should break water at 30 between 2010 and 2012. This is incredibly good news for Turkey, since it means she is set on a path towards both political and economic maturity (basically, as a kind of loose, rough and ready yardstick, we might say that the demographic dividend years are around the 27 to 32 interval. China currently has a median age of 33 and India has one of 25. China has just benekited from the dividend, and India is just about to do so). So Turkey's progress, on any measure, has been impressive, with the dollar value of gross domestic product rising from US$154 billion in 2001 to US$403 billion in 2006 (see chart above, IMF data). Part of this dramatic rise has been a by-product of the (pre-June 2006) sustained rise in the value of the Turkish lira, but this kind of rise is just what we should expect to see repeated in developing economy after developing economy, from China (when they finally ditch the peg) to India and Brazil, and this is one of the reasons why the high compounded annual growth rates that these countries are experiencing right now will have a pronounced non-linear impact on living standards, with the gap with the developed world being closed much more quickly than most observers are currently contemplating. On most conventional estimates, Turkey’s potential growth rate may well be, as we have been seeing, around 7.5% (or possibly even a shade higher) a rate which is more than twice the estimated average growth potential for the EU 25 countries to put things in some sort of perspective. If this growth differential were to be sustained over a significant period of time then it is perfectly plausible that Turkey's per capita income could increase from the current 30% of the EU-25 average to around 60% by 2020. But the if here is, of course, a big one. Be that as it may, and accepting the evident uncertainty which surrounds such forecasts, what is clear is that there is a clear potential for rapid growth in Turkey, and it is this impressive potential which has lead Serhan Cevic, for example, to start talking about Turkey being on the verge of becoming a trillion dollar economy. Of course, volatility forms part of the normal and natural functioning of financial markets, and the if the volume of speculative positions attached to any currency starts to balloon, and as a consequence inflation and current account deficit fears also start to set in, then it is really in the normal course of events that the level of risk-averse anxiety should rise rapidly, and this increase in the anxiety register, as we are seeing right now, can provoke sudden shifts of sentiment which can wreak economic havoc, especially in the context of emerging markets. 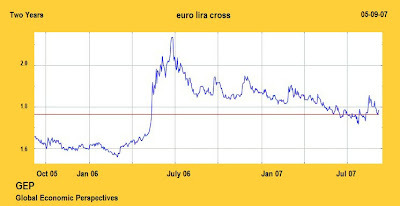 And so it was in Turkey in the early summer of 2006, when intensifying risk nervousness, of the kind that can weaken even commodity-based currencies in the midst of a commodity bubble, caused a capital outflow hemorrhage from Turkey’s financial markets and a very sharp depreciation in the value of the lira - at one point the drop was 19.0% against the dollar and 21.3% against the euro, and all of this in a matter of just four weeks. The impact of the outflow was such that the 5-year bond yield increased by 460bp from 13.4% to 18.0% over the same period, an up-jerk which naturally lead to a sudden contraction in the availability of domestic credit. Faced with the severity of the shock which hit the Turkish economy the central bank had little alternative but to moved aggressively, and the policy rate was raised from 13.2% to 17.25% in the space of just 20 days. 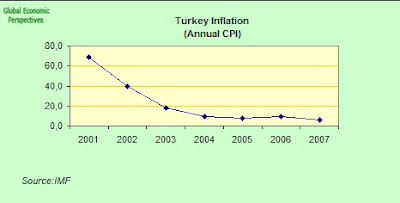 As of September 2007 the overnight borrowing rate of the CBRT is still at 17.5%, ie subsequent to this "event" there has been no monetary easing, a feature of the situation which should give some pause for thought when you come to look at the fact - as we will see below - that Turkey's expansion has not only survived the shock, but has in many senses "carried on regardless". This is in stark contrast with what is happening in say Hungary, where a central bank base rate of a "mere" 7.75% is currently sending domestic demand spiraling downwards and begining to provoke what may well turn out to be quite a severe recession. So why the difference? What makes Turkey so special. This is the question we will be asking here. With the benefit of hindsight it is now obvious that the giddy bout of global risk aversion which arrived "suddenly last summer" hit Turkey’s financial markets far more than the underlying macroeconomic fundamentals would justify, and part of the evidence I would present to justify this assessment would be the way in which the Turkish economy has subsequently weathered the storm (see below)and recovered its upward trajectory. This underlying reality did not however stop foreign investors from cutting their exposure to Turkish government securities and other lira assets by a whopping US$9 billion during May–June 2006, and in the process fuelling a sharp decline in asset prices. Regardless of whether there was a coherent economic justification for the sudden eruption of financial volatility in the Turkish case, given the level of liquidity-driven speculative positions that were present across the globe in mid 2006, the onset of a herd-like rush to beat the rest to the door should have surprised no one, especially since, in the 16 months from January 2005, capital inflows that could have been categorised in some broad sense or other as ‘hot money’ to the value of some $18 billion had entered Turkey, and this had clearly served to push the lira’s valuation up above the "comfort zone". On the macroeconomic side of things, subsequent to the crisis - and following adherence to the 6.5 percent GNP primary fiscal budget surplus target advocated by the IMF in combination with the strict monetary policy restraint that was applied by Turkey's independent central bank, - inflation has once more been started to come steadily down, and with this turn in inflation and in the public borrowing requirement there has been a revival in confidence, and the start of an easing-off in the level of real interest rates. In this context having a floating exchange rate has proved to be an effective shock absorber for Turkey, and it has provided significant incentives for the intelligent management of the risks associated with sharp corrections in currency values. There are, however, other measures we could use of Turkey's robustness. 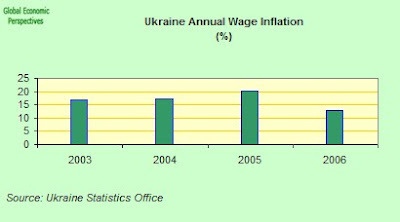 One of these is inflation, and it is to this topic we will now turn, since given the dramatic currency correction, the risk of a wage price spiral was clearly present. Fortunately this risk, as we will now go on to see, has not come to fruition. 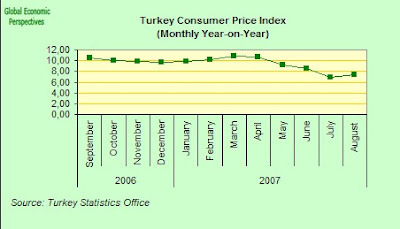 According to the Turkish Statistics Office the August 2007 monthly change in the Consumer Price Index was 0.02%. This represents an annual rate of increase of only 2.4%. In and of itself this is a striking number, especially in the Turkish context. The figure is however a deceptive one and the general CPI was in fact up by 7.93% on a year-on-year basis, while the twelve month moving average was 9.46% . 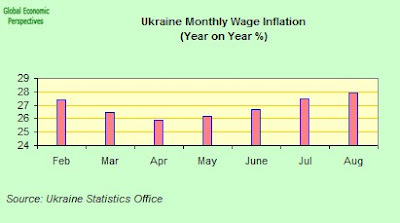 The monthly movement in the CPI over the last 12 months can be seen below. What we can see at first glance from the graph is that despite the massive financial and currency shock of last summer, the monetary tightening process operated by the central bank has proved to be remarkably effective in holding inflation under control. The hardest component of the CPI for the central bank to contain (apart that is from energy) is the index for non processed food and this was up by 1.9% in August. In this context it would perhaps be well to remember that food represents some 28.5% of the CPI in Turkey (since of course Turkey is still a developing economy). Thus a significant part of the recalcitrance of the CPI to the anti-inflation efforts of the central bank can be directly attributed to difficulties in containing inflation in the food category. Interestingly, a somewhat similar situation can be observed in China. Here are the monthly movements in the Turkish food component over the last 12 months. Behind the stubbornness in food prices lies in part the question of climate. Weather anomalies present a challenge to economic management since they find expression in the volatility of food prices. Surface temperatures in Turkey have been running around 4˚C above the normal seasonal pattern so far this year, and average rainfall is running about 60% below the long-term mean. Such dramatic changes in climatic conditions are not just a local Turkish phenomenon, of course, but that does not make them any the less troublesome for the Turkish authorities. 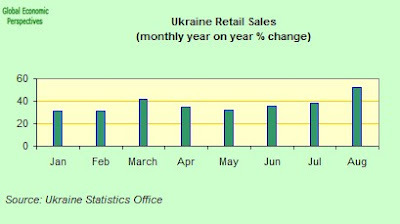 Thus the year-on-year rate of change in food prices has increased from 9.2% in July to 12.4% last month, largely because of a 1.9% monthly jump in unprocessed food prices which consequently pushed the annual inflation rate for this sub-category from 8.9% in July to 16.2% in August. Thus Serhan Cevik argues that supply constraints stemming from climatic changes and higher exports to Europe (where adverse weather conditions have also lowered agricultural production) exert and will keep exerting an upward pressure on food prices inside Turkey, and thus on the CPI. So for the present inflation seems to be trapped in a fairly tight range, around the 6 to 8 percent mark, but still this, it should not be forgotten, is quite an achievement given that Turkey comes from an average of inflation rate of 73.7% in the 1990-2001 period. What is at issue here is not some mysterious Turkish resistance to a correction in major domestic imbalances but rather the combined impact of a number of evident supply-side shocks - higher energy prices, an untypical surge in food prices and the sharp depreciation in the lira. Despite this core measures of inflation confirm a gradual and steady downward shift in inflation dynamics, with the seasonally adjusted core CPI excluding unprocessed food posting a month-on-month drop of 0.3% last month while the year-on-year "core CPI" inflation rate has been steadily dropping to 6.2% in August from 6.6% in July and 10% in March. 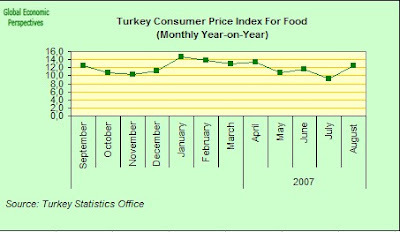 It should also be borne in mind that as living standards rise in Turkey, and a modern domestic consumer based economy develops there, food will cease to constitute such an important component in the CPI basket, so a structural solution to a structural problem is in fact in sight, and continuing economic growth is the key. On another level it is clear that there has been something of a disconnect between the sharp retrenchment we have seen in consumer spending (final domestic consumption was, for example down 0.3% year-on-year in the latest Q2 2007 data released by Turkstat) and the resilience of inflation to further downward adjustment. 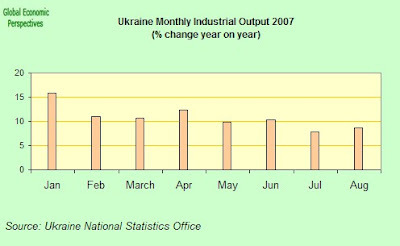 The sudden and aggressive tightening of monetary conditions implemented by the CBRT last summer has produced an abrupt slowdown in domestic demand, and the rate of private consumption growth has fallen steadily from the 9.9% rate in the first half of 2006 to the 2.3% one in Q3 2006 to the 0.1% one in Q4, and now to the negative -0.3% in the last quarter. Current consumption growth readings are in fact the lowest since the 2001 crisis. This then is a significant slowdown, and it is also interesting to look at the subcomponents, where we find, for example, that the consumption of durable goods fell dramatically, from an annual growth rate of 14.2% in the first half of 2006 to a negative -8.3% rate in Q3 and -6.3% one in Q4 of last year. This argument is often used in order to criticize the kinds of reforms the AKP government has been introducing, but such cricisms are misplaced and short-sighted as I will try to explain in what follows. They are misplaced since they tend to ignore Turkey's underlying demographic reality. Indeed, in the cities - where hundreds of thousands of rural workers flock each year in search of jobs - the unemployment rate is even higher than the national average, and in 2006 was still hovering around the 12.5% mark. And not only is unemployment comparatively high, the participation rate - which is normally under the 50% mark - is excessively low. So could we say that this has been a jobless recovery? Well yes and no. 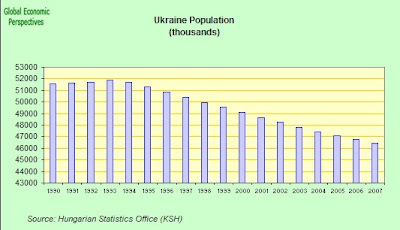 The important issue to think about here is Turkey's demographics, and the natural rate of population increase. The Turkish Industrialists' and Businessmen's Association, for example, argued only last month that Turkey needs to create at least 550,000 jobs each year, just in order to mark time with rate of non-agricultural unemployment. 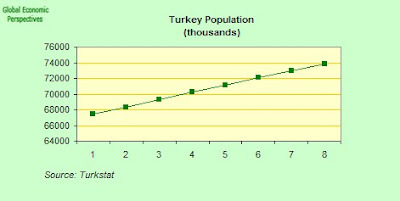 On the other hand we may also think about Turkey’s growing young population from another point of view, as a demographic gift which can help accelerate economic convergence with the developed economies, following the well know phenomenon of the demographic dividend whereby a steadily rising share of people in the working age population age ranges serves to increase per capita living standards in a non-linear fashion. Indeed the expression Anatolian tiger in the title of this post is a direct reference, not only to the earlier Asian tiger phenomenon, but also to the rather more recent - Celtic tiger - Irish one, with which certain direct comparisons may be made. Turkey is now faced with many years where the share of the population in the working age group will be high, and not only this, with steadily growing percentages of the working population in the key 35 to 50 age range. This is key, since this is the age range where productivity tends to be higherst. However, for this potential to be transformed into a reality Turkey needs to improve the functioning of its labor market and to bring its employment rate more into line with the European average. 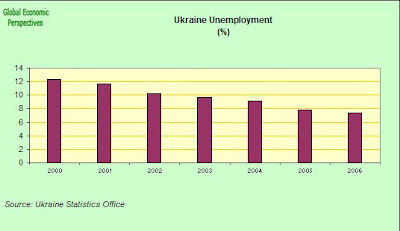 To achieve this objective the number of those employed needs to increase by almost 50%, or by 12 million workers. This single issue, the massive "reserve army" of labour that Turkey has waiting in the wings ready to bring onto centre stage, is arguably the biggest single difference between Turkey and the other EU12 accession economies. Turkey is - in the foreseeable future at least - certainly not going to suffer from any looming labour scarcity problem, but equally if it doesn't manage to put all those people to work it isn't going to close the per capita incomes gap with the developed economies. It is a difficult balancing act that is involved here. Given the significant difference between per capita GDP and per worker GDP, simply putting all Turkey's potential workers to work would mean achieving - in and of itself - a level of per capita income that would push above the 50% of the EU-25 average mark, and this would be without assuming any productivity improvements whatsoever. This is why Turkey’s growing young population needs to be seen as a demographic gift that can help accelerate the pace of income convergence. The key problem is the inadequate level of employment, and the need to establish a powerful job creation machine. Thus while the working-age population in Turkey constitutes 71.4% of the total population (as compared to the 64% European average), total employment in Turkey only amounts to 43.3% of the working-age population (as compared with 63.8% in Europe). Put differently, the Turkish economy is utilizing less than half of its workforce, due in large part to an unusually low labor force participation rate (47.9% versus 72% in Europe). True a slight upward trend can be identified across all that fluctuation (in fact, if we look at annual averages, there were 1,600,000 more people working in 2006 than there were in 2000, or an annual average job creation rate of 280,000 or so, but this needs to be compared with a rise of 5.5 million in the over-15 population during the same period, thus without even budging the participation rate Turkey could have comfortably created roughly half a million jobs a year), and true there is a shift in the pattern after mid 2006 (according to Turkstat, Turkey's working age population increased by 854 thousand between May 2006 and May 2007, and at the same time non-agricultural employment increased by 489 thousand, but it is too soon to decide whether there is any real trend here, since the latest data we have is in fact for May), but still, Turkey has evidently still to create the huge jobs creation machine it so obviously and so pressingly needs. This being said, the massive rise in GDP in comparison with the much more modest rise in total employment - and assuming a fair amount of "job churn" - does imply that the quality of employment has improved considerably, and this, as we will see in the next post, is reflected in the productivity numbers. The next graph, which shows the total population in the 15 to 24 age group post 2000, and the numbers of people in that age group in employment is very revealing. 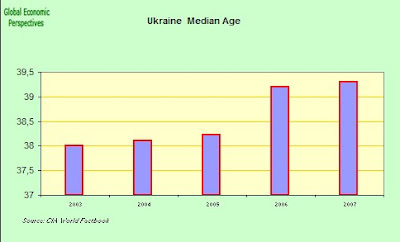 In the first place it show that the numbers in this group have remained stationary during this period (ie they ceased to rise) and indeed now are starting (in this very year, 2007) to turn down, what this means effectively is that we are now in the very core or heart of the demographic dividend period, ie at a critical moment. What we can observe, of course, is something which should be relatively obvious, that the employment participation rate of males is much higher than that of females in this age group, and this shows directly why the issue of female empowerment is so important in a case like Turkey's. 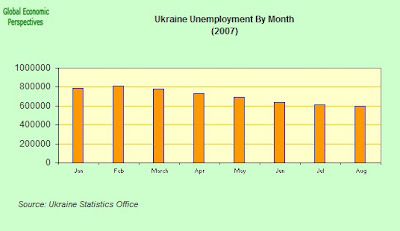 It is also interesting to study the unemployment rate (which is a combined, male and female, one), and while it is clear that unemployment in this age group is still high (as in so many economies) the level may well have peaked for the time being, barring a sharp recession or the like, which does not seem to be in the offing at the present time. But why is it that Turkey, at the same time as it is experiencing the longest sustained economic expansion in its history, struggling to create jobs? Like many other issues in economics, there is no single-variable explanation to lean on here. First off, structural changes, which in fact lay the basis for employment growth in the longer run, often slow the pace of employment growth in the short run, especially if older, non-productive jobs in more traditional sectors are shed in the process. Secondly, there is an ever widening mismatch between the average level educational attainment and the needs of Turkey’s newly developing industrial complex. The Turkish educational system is in sore need of reform. And thirdly, institutional bottlenecks keep the economy’s labour absorption capacity well below the rate of increase in working-age population. Among these the tax wedge of high non-labour costs must occupy a prominent place encouraging, as it does, a high level of activity in the submerged "informal" sector. 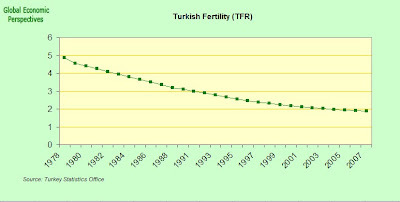 The longer term phenomenon which has so influenced the structure of Turkey's population, initially producing the rapid rise in the number of labour market entrants, and then producing the leveling-off in the numbers of those in the younger groups is, of course, the evolution of Turkey's total fertility rate, and this, as we can see blow, has been falling steadily in recent years. 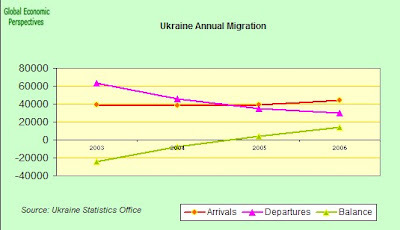 Although there is some discrepancy in the data between the numbers published by Turkstat and the assessment of informed external demographic observers (who tend to have Turkey pinpointed as being below replacement fertility since the late 1990s) there can be no doubt about the strong downward movement in Turkish fertility over the last decade or so. This will produce in Turkey, as we have already seen in, for example, Southern Europe, somewhat perverse consequences, as the proportion of working age population steadily rises, followed by the proportion of prime age workers. This is what gives the economic "catch up" process its strong momentum. 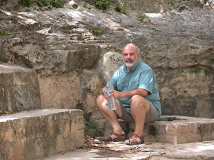 There is also however, a long term downside to this process as first the proportion of prime age workers will at some point begin to decline, and then the proportion of working age population, as ongoing low fertility and increasing life expectancy have their structural impact, and Turkey starts to age rapidly. All this of course lies well out in the future, but, strange as it may seem, this is topic a question, as we will see in the case of pensions in the next post, which Turkey needs to address now, while the going is good, and not postpone, in the way that Italy for example, has postponed, at least if Turkey wishes to avoid facing the kinds of problems which now confront Italy she would be well advised to start thinking about all of this right now, and not move forward on a "live now pay later" (also known as PAYGO) basis. In the first part of this post we looked at the recent strong performance of the Turkish economy, and examined some of the reasons why this time, in Turkey's case, if there is a sudden decline in global risk appetite things might be a little different, and why that old stereotype of Turkey as the paradigm of emerging market vulnerability may just have passed its sell-by date. This being said we do need to remain on our guard, and should all be well aware of the significant risks which continue to exist in Turkey and taking clear note that the passage away from the "troubled waters" zone does not mean that everything from here on in is going to be just plain sailing. As I have indicated Turkey's economy has already undergone substantial modernization, becoming in the process less reliant on traditional sectors and more dependent on international trade and foreign investment. The Turkish economy has become considerably more open, with exports continuing to gain in market share, as the impact of currency appreciation have been largely offset by productivity gains. Turkey's large and growing population of young workers has meant that there has been tremendous slack in the labor market, and this has kept has kept labor costs largely in check. In recent years bank and company balance sheets have also strengthened. Public debt ratios have come down considerably, and the composition of the accumulated debt has improved. Yet issues remain. Some of them are structural, and some largely conjunctural. This post will examine one of the structural issues - getting it right with Turkey's creaking pensions system - an important topic, since Turkey should be seen here as a representative for a whole slew of newly developing economies, Brazil, India, Thailand etc, and getting it right in the Turkish case - and in particular avoiding the pitfalls that have become so evident in the case of large developed economies - like Italy, for example - can be considered to be of no little importance. Other issues confronting Turkey are conjunctural ones, associated with - for example - the ability of the emerging markets generally to survive any significant downturn in the US economy, or Turkey's degree exposure to any possible looming credit crunch. However, as I argue in this post, there are reasons to adopt the view that Turkey, even while not exactly consecrating itself into the "safe haven" category, may well perform better under stress than many apparently comparable economies will, and indeed Turkey's ability to weather any coming storm may well strongly surprise the cynics. The second part of this post will spell out just why I consider this to be the case. Turkey is currently in the process of implementing a comprehensive process of pension reform. Two new social security laws, both of which form part of the structural performance criteria contained in Turkey’s IMF program, were passed into law in May 2006. The first of these, the social security administrative reform law became effective as of May 2006 and the second - the social insurance and health reform law - came into force on 1 January 2007. The aim of these reforms is to both unify the currently dispersed pensions systems and to reduce the significant - and rapidly growing – social security deficit, a deficit which rose to 4.8% of GDP in 2005. 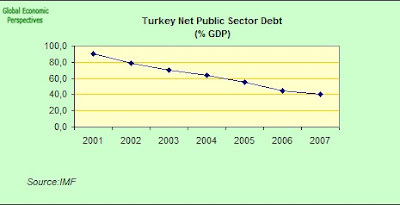 In fact, the value of the deficits registered by the Turkish system could in no way be considered insignificant since during the decade 1994-2004, and adding-in debt servicing costs, the cumulative total of the deficits amounted to roughly 110% of GDP or 1.5 times the entire public debt. And this at a time when, as I have been explaining in the first part of this post, Turkey has a remarkably young population. Prior to May 2006, the Turkish social security system was composed of three separate institutions: one for for private and public sector workers (the SSK), one for civil servants (the ES), and one for self-employed workers and farmers (the Bağ-Kur). The three systems all ran deficits for more than a decade, and this, as I say, despite very favourable demographics. These deficits subsequently required increasingly large transfers from the general budget, and the fiscal pressure arising from all these transfers was undoubtedly one of the big ingredients behind the various fiscal crises Turkey has experienced in recent years. An initial, but rather half-hearted, attempt at reform was made in 1999. This reform did produce a temporary drop in the size of the deficits in both the SSK and Bağ-Kur systems, even if the two of them subsequently started to rise again as a result of both discretionary increases in the pension level and a shrinkage of the premium base. In the Emekli Sandiği (ES) system there was very little in the way of fundamental parametric reform - only one of the main structural parameters was changed - and so naturally the deficits in this system have followed their steady and continuous upward path. The first of the new laws (the social security administrative reform law) unifies the three separate social security institutions into one. This single change will greatly improve the ability of the administration to accurately monitor the number of those insured, the flow of revenues and expenses, facilitate the enforcement of social security registration, and permit greater mobility of the workforce between the public, private, and self-employed sectors. As has been repeatedly stressed here, Turkey still has a very young population and a low old-age dependency ratio. Thus with an annual growth rate of about 1.25% in the working-age population, it is hard to see why Turkey should have had any kind of pensions deficit at all. 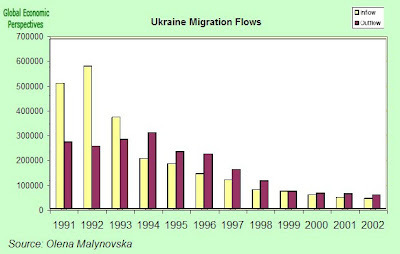 Furthermore, today’s demographic advantages are about to start to disappear, and the ageing-population-effect which will arrive in Turkey as it does elsewhere will eventually lead to a large and unmanageable deficit unless the Turkish authorities begin to adjust now the benefit and contributions balance. In addition, in a country where the tax wedge (or if you prefer the level on non wage costs) is already higher than in many current EU Member States, any tax hike to pay for the deficit only risks further increasing informal employment without generating substantial revenue growth. This then is obviously not the way to go. In fact, all of the above already sounds ominously reminiscent of one of Turkey's northern Mediterranean neighbours: Italy. As populations age and age pyramids invert social security systems based on the pay-as-you-go model are fast becoming unsustainable in a growing list of developed countries around the world. And as the Italian case so clearly illustrates, state-administered pension schemes can start to be run on unrealistic promises and unfunded liabilities can be allowed to accumulate (especially as the average voter age starts to tick up towards that magic 50 threshold), with the predictable result that you can get your whole public finance system into one hell of an incredible mess if you don't address the issues in time. Worse, with rising voter ages it becomes ever harder to do anything about the situation. Italy’s annual pension spending already exceeds 14% of GDP and accounts for approximately 38% of total government expenditure while unfunded liabilities have now reached something like 200% of GDP. The problem is that as Italy's average voter age fast approaches 50 it gets more and more difficult to get the electorate to agree to the much needed reform. At first glance Turkish pensions do seem particularly generous and distorting. The ratio of the initial pension salary to the net earnings at work — the so-called replacement rate — is 90% for private-sector employees, 106% for civil servants, and 127% for the self-employed. Furthermore, 62% of Turkish pensioners are below (and often well below) 60 and many thus receive pension salaries for a period of three decades (which is now near to average period for receiving pensions). As a result, absent comprehensive reform, transfers from the central government budget to the social security system could already the 12% of GDP level before we get to 2020. In addition, since Turkey, when compared with other EU Member States, has a very low rate of social security compliance, the sheer scale of the resulting informal sector, together with the very low levels of accumulated human capital (and consequently value added per capita), suggest that high contribution rates are more harmful in Turkey than in wealthier countries with high tax wedges. By pushing the cost of low-skilled labour above its marginal productivity, firms are de facto encouraged to hire such workers informally, thus feeding the economic duality that characterises almost all aspects of the Turkish economy. Indeed, it is difficult to imagine any significant contraction in the size of the informal sector as long as the on-cost of employing labour in the formal sector remains so high. And it is important to bear in mind here that even given Turkey's relatively favourable start point, the proportion of those 65 or older as a percentage of the active population (aged 15-64) is projected to increase from the current 9% to around 28% by 2050. In this context it is interesting to note that former president Ahmet Necdet Sezer's, was not only a staunch opponent of any watering down of the secular basis of Turkey's constitution, he was also a fierce opponent of any attempt to seriously reform the Turkish pension system, going so far at one point as to veto the proposed raising of the minimum retirement age. So could there possibly have been any connection between the insiders who were the beneficiaries of Turkey's strongly secular state and the insiders who stood to benefit from the ludicrously archaic pensions system? Methinks that perhaps there might have been. In fact Sezer's objections to pension reform went in total disregard of Turkey's underlying economic and demographic realities. Even though the proposed pension reform could be thought of as one of the most important modernisation initiatives ever introduced in Turkey given its key role in guaranteeing the sustainability of public finances and future economic stability, the legalistic treatment of the topic demonstrated by the former president seems to have been based on an extremely outdated point of view, one which seemed completely out of touch modern economic and demographic realities. 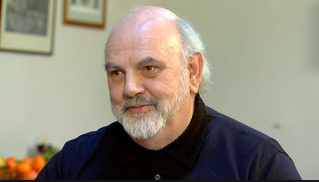 Sezer argued, for example, that the ‘social state’ was required of necessity to finance a pension deficit and used this concept as a basis for objecting to an increase in the minimum contribution period from 7,000 to 9,000 days and a reduction in replacement rates. Leaving aside for the time being the questionable rational foundation for such assessments, even the outdated Turkish constitution does place some importance on the need to maintain an actuarial balance in the pension system, so it is hard to see what a supposed "guardian of the constitution" was doing advancing the arguments he actually advanced. And since the pre-reform average replacement rate stood at 96% — roughly 50% above the current EU average — parametric adjustments were not only economically justified they were, and without a shadow of a doubt, constitutionally required. Interestingly President Sezer also expressed opposition to the raising of Turkey's retirement age (which at the time was 58 for women and 60 for men) to 65 by (and wait for it) the "prudent" horizon of 2048, on the grounds that Turkish life expectancy was, on average, only 66. But the second and more important point is that what matters most for the pension system is life expectancy as of the age of retirement and this of course depends on the age at which you retire. 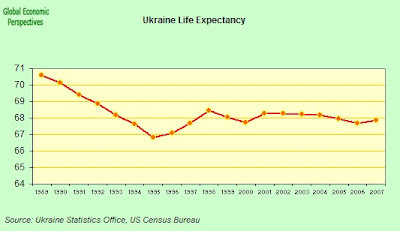 Moreover, and as can be seen from the above graph, life expectancy has been rising steadily, and it most likely will continue to rise, and possibly reach a level which has been estimated to be in the region of 85 by the time we get to 2048. At the end of the day the important point to grasp here is that Turkey’s current pension's crisis is not a result of dramatic population ageing (as in the case say of Japan, Germany, or Italy), but is a consequence of earlier set of populist oriented political decisions, such as the one taken in the mid 1990s to reduce the retirement age for women to 38 and that for men to 43. It is hardly surprising in this situation that the number of active workers for each retiree declined from 9.7 in 1965 to 1.7 last year. So what needs to be stressed here is that even though Turkey, with a young and growing population, still has a clear window of opportunity to design a sustainable pension scheme, this window will not be open for ever. 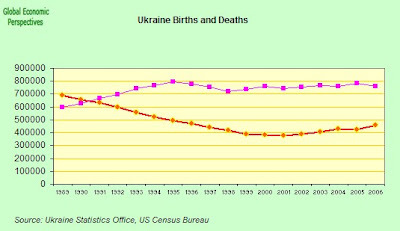 Demographic shifts produced by below replacement fertility and steadily rising longevity will bring significant changes in the age structure of the population. 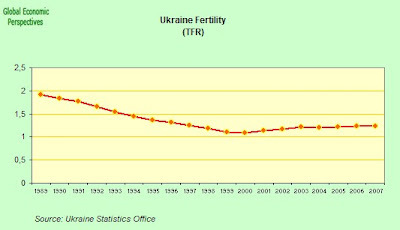 Indeed, as we have seen above the total fertility rate has already declined from 5.3 children per woman in 1965-1970 to just above 2.1 in the late 90s, and on some estimates (eg that of the demographers at the US census bureau) it has already fallen below the replacement rate level during the early years of the present century. As a result of such changes Turkey is about to see a marked increase in the share of the over 65 population, with this group projected to increase from around 5.7% of the total today to over 20% by 2050. In this context the ever widening pension deficit constitutes a significant potential threat to Turkey's economic and financial stability. Further, and even after the latest reform, the new pension rules are being phased-in too slowly in two respects. 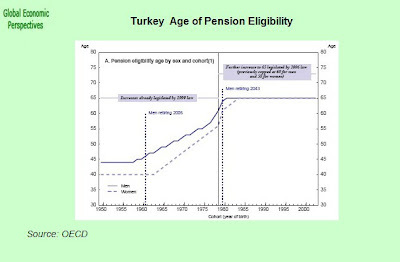 First, although the pension eligibility age in Turkey is the lowest in the OECD, based on the current regulations it is projected to increase only very gradually in the coming years. The underlying problem here goes back to the years between 1986 and 1992 when a variety of populist-driven changes effectively eliminated the minimum retirement age, and even, in some cases, went so far as to permit retirement after less than 15 years of contributions, apparently in the hope that this would serve to cut unemployment. This objective it manifestly failed to achieve, but it did send the social security deficit soaring, and it did effectively "free off" large numbers of early retirees for work in the informal sector while, naturally, continuing to draw their pension. Even after the stricter conditions for early retirement that were introduced with the 1999 reform, more than half the pensioners currently in the private sector workers system (the SSK) are still younger than the official retirement age (58 for women and 60 for men). Moreover, more than three quarters of the pensioners are younger than the higher long term benchmark of 65 , and this percentage is expected to remain high for several decades to come. At present, with a pension eligibility age of 44, and a life expectancy (at age 44) of 76, women enjoy an average retirement period of 32 years, whereas men, with a pension eligibility age of 47, enjoy an average retirement period of 28 years (given life expectancy of 75 at age 47). No other OECD member country has such long average periods of pension eligibility. The big difficulty is that the present reform, instead of applying the new pension formula to current workers, will only have them applied to new entrants to the labour force from 2007 onwards. Workers who straddle the different sets of pension rules will thus have their pension calculated as the weighted average of the full-career pensions that they would be entitled to under each of the four earlier sets of rules. This means that the more generous pension rules of the pre-2006 system, and those of the pre-1999 system, will continue to impact on pension entitlements for many decades to come as can be seen in the above chart. In addition, the long-run parameters of the new pension formula will only take effect from 2016, allowing an interim formula to operate between 2007-2015. So Turkey, even its favourable population dynamics, is already in deep trouble on the pensions front. The twin combination of large numbers of early retirements and a sizable submerged economy has meant that the ratio of pensioners to premium-paying workers has risen steadily from 15% in 1970 to around 60% last year. In other words, there are currently only 1.69 contributing workers in Turkey for every pensioner, and the annual cost of Turkey’s social security system exceeds the average pension spending of 10.5% of GDP in the EU and is getting dangerously close to 14% in Italy. Turkey still has time, but it needs to act now. As we have seen in the course of these two posts, there are reasons, and plenty of them, to be optimistic about Turkey's mid-term future, and with this the future of the Turkish economy. Turkey is still a young society, and has the energy and the possibility to learn from the mistakes of others. However, strong internal demand growth, still buoyant capital inflows, and a continuing negative outlook on in ex-energy terms of trade front, continue to produce ever wider trade and current account deficits (the CA deficit was 6.6% of GNP last year). Recent export performance has generally been above expectations, but this has a lot to do with the favourable global economic climate and the consequent strong levels of external demand. Imports, however, have also continued to rise reflecting the relative resilience of domestic activity to the central bank's monetary squeeze, and the lira’s steady appreciation since last June's crisis. 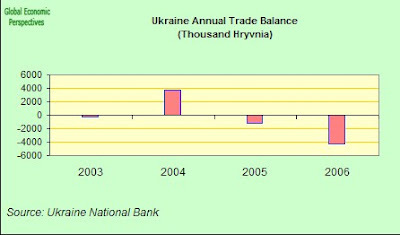 The trade deficit, has a consequence, continues to grow unabated - as can be seen in the chart below - and, of course, with the trade deficit the dependence on the inward flow of funds remains. So, in addition to the longer term structural challenges (such as the issue of the pensions system, or the systematic reforms which are required to meet the needs of the EU accession process) a variety of rather more short term macroeconomic headwinds also exist. In particular, we need to be constantly aware that a key driver in the renewed upward march of the lira has been the buoyancy of capital inflows, flows which have been increasingly underpinned by a growing volume of FDI. The economy's dependence on large capital inflows continues to expose Turkey to swings in investor sentiment, and makes Turkey potentially vulnerable to any incipient global credit crunch and decline in risk appetite. 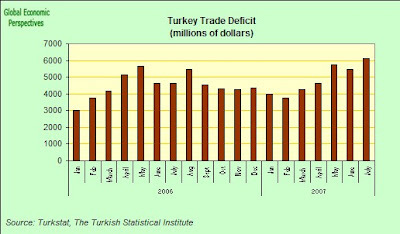 On the surface Turkey’s susceptibility to any slowdown in the US economy might be thought to pass through the financial channel, since Turkey’s direct exposure to the US economy is limited - exports to the United States constitute a mere 5% of total Turkish exports. However, and as reported by Morgan Stanley's Serhan Cevik here, Turkey’s growth correlation with the US has increased in recent years, from -0.16 in the 1990s to 0.71 since 2001. This increased correlation is striking, and most likely reflects indirect trade linkages (via parts of Europe which are - like Germany - in their turn dependent on exporting to the US) and via financial integration than it does any direct dependence on the US economy. The correlation found by Cevik is striking, in particular since it is so close to a correlation recently reported by Japan economy specialist Richard Katz (0.74) for the Japanese economy with the US one. Since these two economies obviously exhibit very different characteristics and relations with the US economy the conclusion I rather draw here is not a US-centred "coupling" situation, but in fact that the key areas of the global economy are now more "tightly coupled" one with another than ever was the case before. This, I think, is what the word globalisation means. So Turkey is much more open than it was before, and in this sense is much more exposed to any global - as opposed to merely domestic - correction. In particular Turkey is dependent on some of the main European economies, and especially on their East European component. So we need to be aware right here and now that any burgeoning US slowdown will no doubt have knock-on effects on the rest of the world, and in particular on Germany, and in Turkey’s case this is important, since what matters most to Turkey is the behaviour of the European business cycle, given that exports to Europe account for 60% of total Turkish exports. The Turkish economy is therefore vulnerable to any marked slowdown in Europe, and at the time of writing it is evident that a number of key EU economies - Germany, Italy, Spain - are slowing, although it is still impossible to realistically assess the extent of this downturn, beyond noting that downside risks evidently abound. However, the trade channel is not the fundamental determinant of growth dynamics in the Turkish economy at the present time. What matters most to Turkey is the global risk appetite and the level and extent any impending correction in international capital flows. Abrupt changes in global liquidity conditions increase volatility in Turkey. When global risk appetite deteriorates, emerging economies like the Turkish one with an enhanced exposure to liquidity-driven capital flows naturally get hit worse than others. In fact, even if Turkey was not running a current account deficit, the situation would not be that different, since recent foreign capital inflows have been running around US$50 billion over and above the cumulative current account deficit. 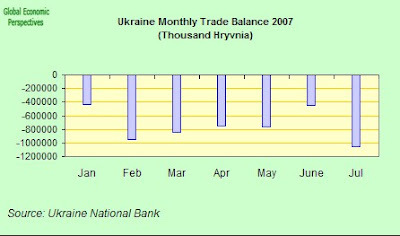 As the process of economic normalization has continued (especially now that those tricky elections are safely over) and as high interest rate differentials (Turkey's central bank is currently offering a 17.25% overnight rate) continue to exert a strong pull, the various categories of “carry trade" have now resumed, and foreign investors have steadily rebuilt their positions in Turkey's domestic bond and money markets. Moreover, anecdotal evidence (as transmitted by both the IMF and Cerhan Cevik) suggests that a significant portion of the recent inflows have been what could be lossely classed as “hot money" ( ie volatile, highly leveraged, and with a short-term focus) rather than “real money" (more stable, with a medium-term focus, investment oriented). Therefore, even a temporary deterioration in domestic or external conditions could lead to a quick liquidation of long lira positions, with damaging effects on Turkey’s overall financial market performance. Foreign investors, for example, are estimated to own more than 70% of the free float in the Turkish equity market, having increased their holdings (adjusted for changes in asset prices) from US$4.5 billion at the end of 2002 to over US$45 billion this year. Foreign investors have also channeled 22.5 billion lira into the domestic debt market over the past year alone, increasing their holdings in the fixed-income area from 8.6 billion lira at the end of 2003 to 45 billion lira this summer. Put differently, foreign investors now carry 16.5% of the domestic debt stock, up from 7% a few years ago. This is why changes in global liquidity conditions inevitably lead to occasional bursts of volatility in Turkey. However, stronger balance sheets in the banking sector and increased resident dollar holdings do now provide a better shield against exogenous shocks . Also the level of Turkey's external debt position has improved somewhat, even if there is still a strong and pronounced dependence on short term debt (see chart below). 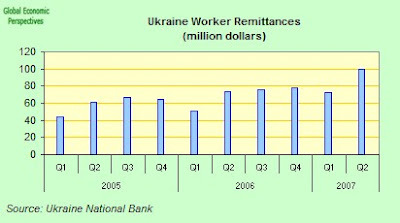 In this context the potential offered by the growing importance of the Unemployment Insurance Fund - whose assets have grown from 362 million lira at the end of 2000 to 27 billion lira this year - should not be underestimated, since this fund invests exclusively in the domestic debt market, providing a local institutional cushion that simply wasn't available before. 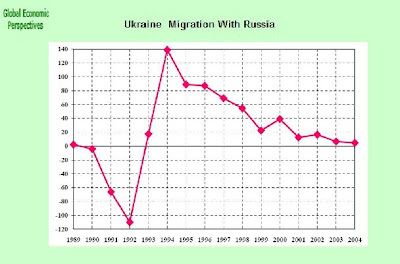 So, favourable demographics and systematic structural improvements surely mean the Turkish economy should now be more sheltered than at any time in the past, and much more than many others (especially Turkey's theoretical "peers" in Eastern Europe, the demographics virtually guarantee this), from the impact of any impending global fallout. Any foreseeable liquidity crunch, with the potential it will offer for an increase in home bias, could well weaken the lira, temporarily worsen the inflation outlook and even lead to slower output growth. With this in mind real GDP growth estimates for the next 12 months may need adjusting downwards, but probably not dramatically so. While Turkey may well not become exactly a "safe haven" all that money will need to be parked somewhere, and with the comparatively high interest rates that can be offered by the CBRT, and the continuing secular decline in inflation we might imagine that investors are not totally irrational, and thus it is not unreasonable to expect that Turkey will continue to maintain a relatively robust pace of GDP growth - even during a 2008 which will more than likely be stacked with downside risk - and even in the worse case scenario we should expect the Turkish economy to steadily pick up speed again in 2009. In particular, as slack increases in the global economy consumer price inflation should continue its steady and constant decline onwards and downwards towards the Central Bank's 4% target zone, and especially if commodity prices and energy come down somewhat. The Turkish economy has faced numerous challenges over the last five years, but in spite of everything has systematically kept outperforming the normally overly-cautious consensus expectations - expectations that often that failed to take account of the strong demographics which have accompanied the steady structural improvements. Furthermore, following the recent election results the Turkish government is more likely to speed up rather than slow down the implementation of structural reforms, and, as a result, the international competitiveness of the Turkish economy should continue to improve. However it should be noted that - despite all this talk of demographics - Turkey's human capital level is still very low, even in comparison with that of other (developing) countries. To take just one example, the average level of schooling is less than six years in total. Similarly, the share of the adult population with upper secondary education is only 25%, a value which contrasts with the 56% average which is to be found among other OECD countries. A large part of this human capital deficit is the result the ‘gender gap’ which exists in Turkey's educational attainments, a gap which also explains the lowest female labor force participation rate (23%) in Europe. This is why enhancing the economy’s growth potential requires a comprehensive strategy to improve human capital endowment, in addition to policies which focus on macroeconomic stability and microeconomic reforms. So to bring all this to a close, why don't we return to where we started, with the fate of the lira and the growing change in global sentiment. Historically Turkey’s large financing requirements have made it particularly vulnerable to any sudden change in sentiment via a grinding to a halt in capital inflows. 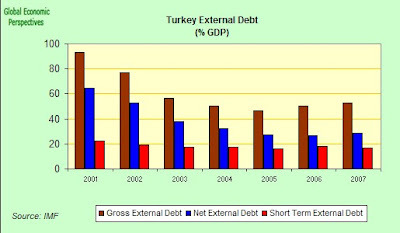 What were perceived as weaker fundamentals than those which pertained in other emerging market economies (a large and widening current account deficit; a still high gross public debt ratio tilted towards instruments with adjustable rates or short maturities; and an uncertain inflation outlook) often exposed Turkey to a sudden reversal of capital inflows. 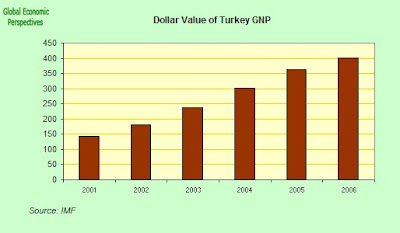 These vulnerabilities were also amplified by Turkey’s hefty near-term public and external financing requirements (respectively, 30 and 27 percent of GNP at the time of the June 2006 crisis) and the still relatively high degree of liability dollarization - especially, corporates’ large net open foreign exchange position, which has been estimated at 10 percent of Turkish GNP (see Appendix IV of IMF Country Report No.06/402). Moreover, large foreign investor positions (“hot money”) in the government bond and money markets (estimated at around 9 percent of GNP), amid less supportive political and global economic environments, have, in the past, made Turkey very sensitive to shifts in market sentiment. But will this continue to be the case? 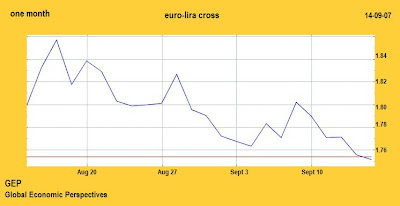 (Since this chart is a measure of the number of lira per euro, the downward movement indicates a rise in the value of the lira vis a vis the euro). True, with bank base rates at 17.25%, there may be good reason to expect the lira to appear robust you may say. The point is that Turkey is experiencing extremely tight monetary conditions and managing to maintain a relatively healthy annual GDP growth rate (an annualised rate of 5.3% over the first six months of this year), while Hungary, for example, which has a central bank base rate of 8%, is plummeting rapidly downwards into recession. It is the reason why the Turkish economy is exhibiting this resilience at this point which is what should be interesting us. One of the explanations for this positive upside surprise would undoubtedly be Turkey's strong underlying productivity position. The history of the tiger phenomenon has clearly shown us that that factor accumulation alone, without accompanying efficiency gains, does not bring sustainable economic growth and rapid increases in per capita living standards. In Turkey’s case, however, productivity improvements have been one of the most under-appreciated aspects of the post-2001-crisis performance, and have been one of the principal drivers of the longest stretch of uninterrupted output growth in Turkey's history. 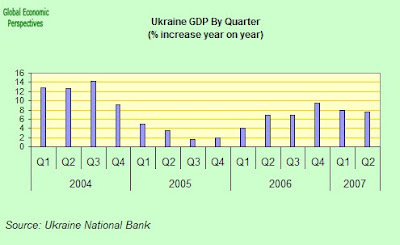 In the pre June 2006 crisis period productivity growth had been steadily accelerating - reaching an annual rate of 8.5% towards the end of 2005, for example. Output per worker surged at a year-on-year rate of 8.5% in the fourth quarter of 2005, up from 6.1% in the third quarter and 3.8% in the first half. Even in terms of output per-hour worked, the rate of productivity growth accelerated from an average of 4.7% in the first half of 2005 to 7.2% in the second half (and 8.4% in the last three months) of the year. This sustained productivity acceleration, as well as providing greater impetus to output growth, was also a big factor behind the massive disinflation which lead Turkey towards single-digit inflation territory. The rise in output per hour-worked in the manufacturing sector was somewhere in the region of 38% in the 2001-2006 period, easily outpacing the 32.5% rise in real GDP. 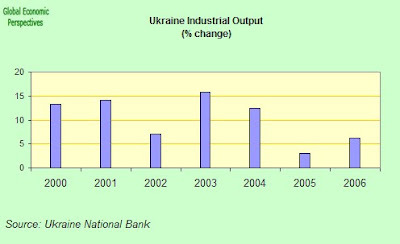 Also the 187.7% real increase in business investment spending on machinery and equipment over the same period - a reading which compares impressively with a "mere" 24.2% increase in construction expenditures — raised the capital/labour ratio and laid the basis for higher trend productivity growth in the longer run. The consequence of all this was that Turkey’s total factor productivity growth accelerated from an average of 0.5% a year in the 1990s to 4.8% in the post-crisis period, and this productivity boom will continue improving the quality and sustainability of non-inflationary output growth. So to conclude where we started in my initial post, both the Turkish nation and the world at large have singularly and notably paid little heed to the strange warning which appeared on the Turkish military website to the effect that the nation was in peril. The nation is in fact in full health, and, guess what, a headscarf is simply that, something you wear on your head. 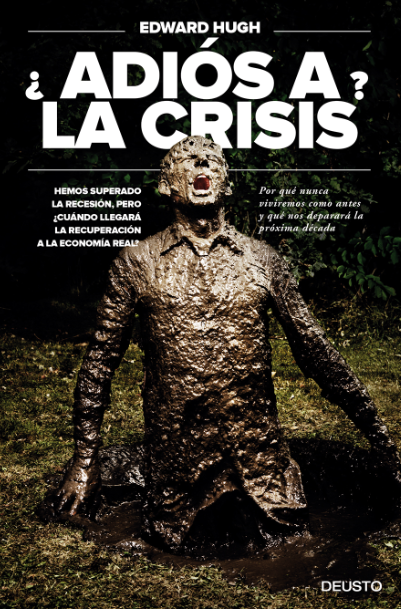 As we have seen the only thing which may really be in peril is a privileged "insider" position in the old institutional structure, built up, strangely enough, via access to pension systems, their benefits, and the control which the consequent funds exercised over the old, tremendously inefficient, state sector. 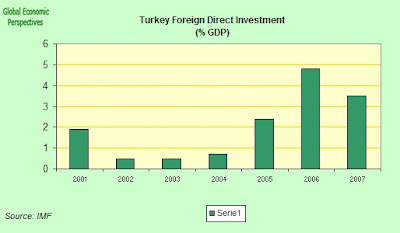 Even so, some might have assumed given the past record, that a stand up fight between an elected Turkish government and the Turkish military might have negatively affected investor confidence, especially given the way in which the 2001 economic crisis was kicked-off by an apparently minor row between the then President - Ahmet Necdet Sezer - and the coalition government, all aided and abetted, of course, by a thoroughly rotten banking system. Yet in May of this year, when the AKP government undertook the initial public offering of 25% of the publicly owned Halkbank, it fetched $1.85bn, was seven times over-subscribed and finished trading the next day at an 11% premium. Something, it seems has changed. To plagiarize one former US president, it's the demography, silly! Looked at another way, we could ask ourselves whether the reason why Citigroup paid a substantial sum of money (some would say an exceptionally generous sum) for a minority share in another Turkish bank (Citigroup paid $3.1 billion for a 20 percent stake in Akbank and indeed have only this month acquired the Turkish brokerage house Opus Menhul Degerler) earlier this year has anything to do with the fact that Turkey is actually the last pristine European market? At a time when investors across the globe are concerned about problems thought to be associated with the US subprime mortgage market, it should not escape our notice that house loans in Turkey are still a relatively new phenomenon - and constitute only 4% of GDP (compared to a European average of around 40%). In the chronic inflation which characterized the domestic environment up until 2001, Turks simply did not borrow, or perhaps - better put - few would willingly lend to them. Consumer loans are currently 20 times higher then they were four years ago, although they still only constitute some 6-7% of GDP, while European averages are in the 35-40% region. As someone once said, there's gold in them there hills (the Anatolian ones, of course) and plenty of it, so let's go and dig. And as for me, ah, well now it really is time to go and smell the coffee.